Join us for Monday Night at the Movies. We'll be meeting most Monday evenings from May 6th-July 29th to watch a different film, from old favorites to new releases. Free popcorn! Closed captioning will be provided when available. This series is paid for with funds from the Gert Salzer Gordon grant. 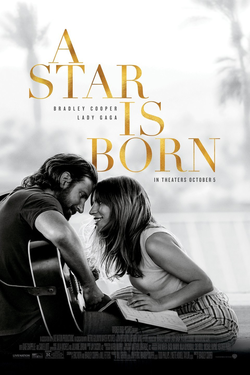 On Monday, May 6 we'll be watching A Start is Born (2018, 135 minutes, R). Seasoned musician Jackson Maine discovers -- and falls in love with -- struggling artist Ally. She has just about given up on her dream to make it big as a singer until Jackson coaxes her into the spotlight. But even as Ally's career takes off, the personal side of their relationship is breaking down, as Jackson fights an ongoing battle with his own internal demons.